Is Johnny Manziel the next Joe Montana? 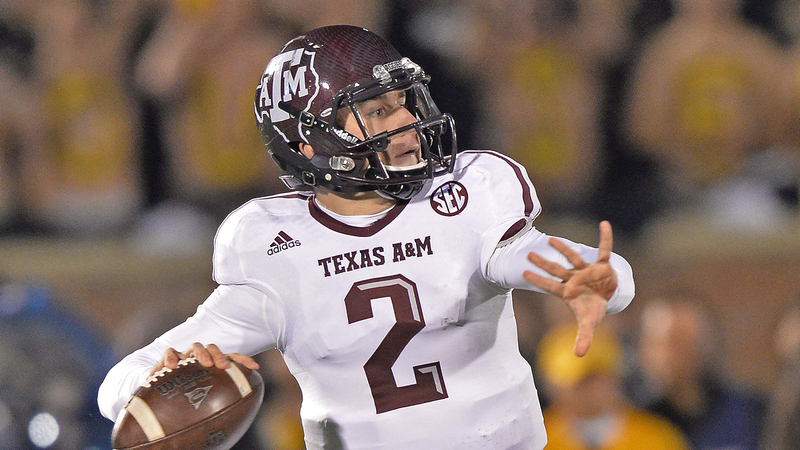 Johnny Manziel has yet to declare for the upcoming NFL Draft, much less play a down of pro football, but that isn’t stopping one scout from proclaiming the Aggie quarterback could be the next Joe Montana. "He reminds me a little bit of Montana," the unnamed scout told the Milwaukee Journal Sentinal. "Fluid, and even though he’s off-balance he can get the ball out. He’s a smaller guy but he has big hands for a little guy. He’s fun to watch." The scout did not mention where he expects Manziel to fall in the draft, stating it will be a four-way contest at quarterback between him, Teddy Bridgewater, Derek Carr, and Blake Bortles. But according to many mock draft boards, the former Heisman winner is quickly moving up the boards, even landing in the top 10 in several. Manziel has no doubt had a stellar college career in just two seasons as Texas A&M’s starter, taking home the Heisman Trophy his freshman year, but it might be too soon to dub him a three-time Super Bowl MVP, and Hall of Fame quarterback. After all success in college doesn’t always translate to results in the NFL.